Dubai, May 28, 2009: H.E. 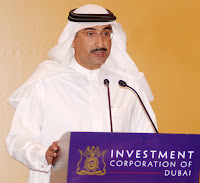 Mohammed Ibrahim Al Shaibani, Executive Director and Chief Executive Officer of the Investment Corporation of Dubai (ICD), the investment arm of the Government of Dubai, today urged companies based in the emirate to uphold the highest standards of corporate governance. He made these remarks today at the first ICD Finance Conference: Risk and Corporate Governance, which brought together more than 150 senior executives from ICD portfolio companies, and senior officials from the Government Departments which include Dubai Department of Finance and Dubai Department of Economic Development. The one-day event was held under the patronage of H.H. Sheikh Ahmed Bin Saeed Al Maktoum, Chairman of Emirates Group and Board Director of ICD, who attended the conference today. It is the first in a series of such events organised by ICD to encourage dialogue and best practice amongst the organisation’s portfolio companies. In a series of presentations and interactive workshops, internationally recognised speakers, senior ICD executives and representatives of Ernst & Young examined a range of critical issues related to the larger theme of corporate governance and risk management. Andrew Scott, Professor of Economics at the London Business School and an expert on fiscal and monetary policy, provided a special address on the future outlook for the global economy. “The theme of the first ICD conference – risk and corporate governance – was chosen in response to the unprecedented challenges facing the world today. This event is in line with ICD’s goal of continuously improving the standards of governance and risk management within its group of companies by sharing knowledge, experiences and best practices,” said Mr. Abdulaziz Al Muhairi, Managing Director of ICD. Among the ICD portfolio companies and related organisations that participated in the event were: Emirates Group and Dnata Travel Services, Emirates NBD, Emirates National Oil Co., Dubai Aluminium Co. Ltd., Borse Dubai, Emaar Properties, Dubai World Trade Centre, Dubai Airport Freezone, Dubai Silicon Oasis, Dubai Islamic Bank, Commercial Bank of Dubai, Dubai Cable Co. Ltd., Dubai Department of Civil Aviation, Dubai Department of Finance, Emirates Investment & Development, Galadari Brothers Co., National Bonds Corp., and Noor Islamic Bank, among others.